Are you after a low cost long lasting Promotional Item that will stand the test of time? The Silverstream Water Bottle is Australia's top selling soft squeeze BPA-Free Promotional Water Bottle, complete with optimal branding space. The 410ml Mini Triathlon Water Bottles is the Australia Made smaller sibling of the larger 750 ml bottle we sell. Whlist small in stature, it is a soft squeeze bottle that comes with ample branding space. Are you trying to keep costs down? Trying to squeeze as much as possible out of your allocated budget? Our Low Cost Water Bottles are here to help! Whether you're riding your bike, playing a sport or just out for the day, this is the product for you! A highly sought after promotional product that is durable and stylish! 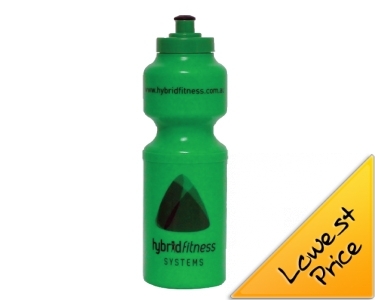 BrandMe Promotional is one of Australia's best value suppliers of Promotional Water Bottles. We have a selection that covers all budgets and when you browse through our selection of bottles you will discover a range that allows you to use these clever promotional items for many applications! We are sometimes asked what makes a good Promotional Product? The answer is simple - a good promo item is something that we can print your logo or message on and is then used time and time again by the recipient. Therefore to work well any item must have an inherent functionality. We all drink, we all need bottles to hold those liquids in therefore such branded water bottles are going to provide repeated exposure to your message and deliver to you excellent value promotion and marketing. There is a great choice of price points to buy water bottles at - we have low cost water bottles for when you require a giveaway product - these are ideal for sports days, as trade show giveaways, as an item for kids or for general brand promotion. As the quality and price of the bottles increases you will generally be looking at metal water bottles. These can of course be given away ad-hoc but are more often used a gift-like product. These are ideal for summer promotions or as a Christmas gift, they are also excellent if you are managing an in-company health drive and want to promote the drinking of water on health grounds. Whatever your requirement the selection of available colours means that your Branded Promotional Water Bottles can compliment your existing brand colours. We are increasingly buying water bottles directly from the manufacturer in China so are able to make totally customised options for you that allow us to let our designers run wild! For factory direct bottles you generally need to be looking at a spend around $5000. For plastic bottles in quantities less than this you are better off focusing on Australian Made bottles as they have a smaller freight cost. We are here to help with your inquiry so please call us at anytime and we will help you select the bottle that will work best for you and your promotion.